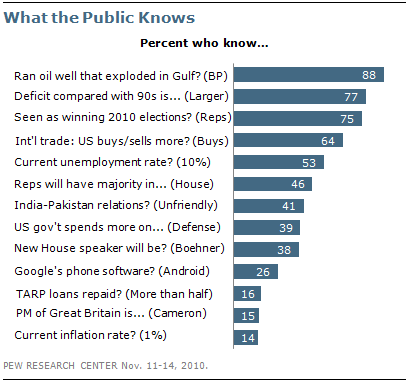 With the 24/7 bombardment of information about the country’s financial crisis, how much has the public learned? Not much, it seems, even about the basics of our situation. Before I go any further, check to see how much YOU have learned, through this test. The Pew Research Center gave its latest News IQ Quiz, a multiple-choice test about current events, to 1,001 adults in mid-November. It found that a few facts have clearly permeated the national consciousness: 88% know that BP is the owner of the oil well that exploded; 77% know that the national deficit is larger today than in the ‘90s. But when it comes to specifics about our financial situation, the results are curious, to say the least. Only 39% knew that the government spends more on defense than on education, Medicare or interest on the debt. When asked how much of the government’s loan to banks under TARP has been paid back, only 16% knew that over half has been returned. 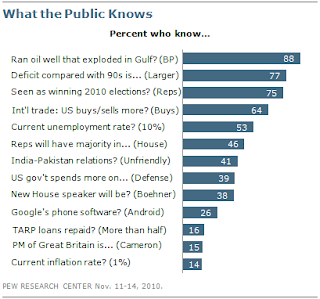 And only 14% knew that the current inflation rate is running about 1%. To me, it’s understandable that only a small number would know the name of the British prime minister (15%) or the incoming Speaker of the House (38%). But our economic outlook is affecting everyone. And for months, especially in the Congressional campaigns, the No. 1 issue being blasted out by the print media, airwaves and blogosphere has been the importance of the government getting our growing debt under control. So this survey raises some questions. Are the media so focused on opinions and “takes” that they are not presenting the basic facts? Is the public simply focusing on the opinions and sloganeering and not making an effort to learn the facts? Or is the public even paying attention at all? For the record: 26% - more than the number who knew about TARP loans or the current inflation rate – could identify the Google phone’s operating system (Android). When You Have Some Extra Time in Washington . . .
Professional Societies: Where's My Generation?